Just like finding a putter and the style of a putter grip that works for you, the size of your putter grip is all down to personal preference. With all the information out there on the internet it can often be confusing as to what size of putter grip can be of benefit to you. That’s why we created this blog post to help you understand what does a bigger putter grip do as well as the pros and cons of a bigger putter grip. So you can make an informed choice as to whether a bigger putter grip is for you or not. So what does a bigger putter grip do? A bigger putter grip can help with a smoother pendulum stroke as well as reducing the amount you manipulate the putter face angle as you come into contact with the ball, leading to better accuracy, due to the large surface area your hands are in contact with when holding a bigger grip. Bigger putter grips generally fall into the oversize or jumbo putter grip category. According to the USGA Equipment rules, a putter grip can have a maximum diameter of 1.75 inches (44.45 mm) so grips close to this diameter size are considered to be within the oversize or jumbo putter grip category and generally seen as a bigger putter grip. Bigger grips are great for encouraging a smooth pendulum swing and due to the fact your fingers are less likely to wrap around each other when gripping you reduce the amount you can manipulate the putter face angle as you make your stroke and come into contact with the ball, leading to better accuracy due to the large surface area your hands are in contact with when holding a bigger grip. The advantages of a bigger putter grip can often help golfers alleviate some common problems that they might have when it comes to there putting stroke. Some advantages fall into the following categories, but ultimately are down to personal preference. 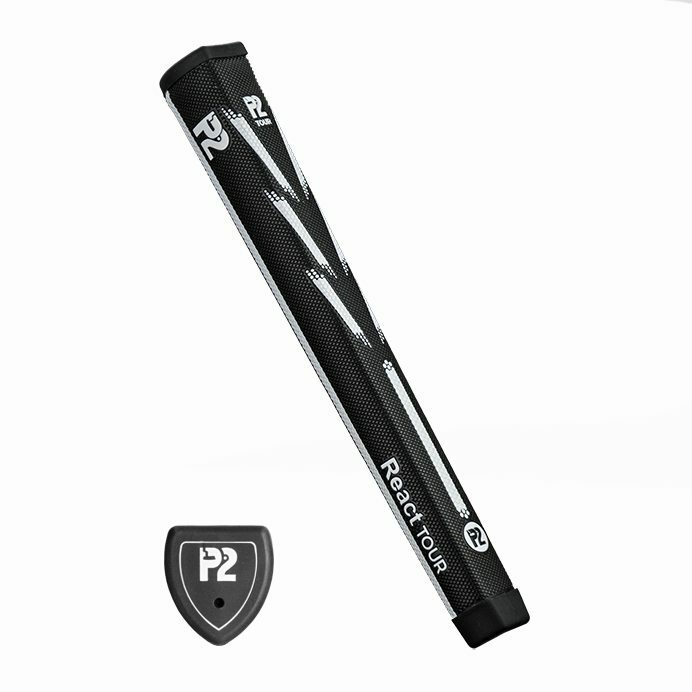 An oversize putter grip can help if your grip pressure is too tight. The bigger the putter grip size and the side profile of the putter grip can often help reduce movement and twisting in the hands, fingers and wrists. This will give you the added benefit of increasing stroke consistency and reducing the potential of missed putts and strokes. A bigger putter grip can help correct a swing issue that you may have. For example, a bigger grip can help align the hips and the body allowing the torso to be more dominant during your putting stroke. A bigger putter grip can help with putting accuracy. A bigger putter grip can help lessen this wrist impact through the stroke and enable a better, more consistent roll on the ball. It can also encourage the bigger arm muscles to dominate, reducing the impact of twitchy wrists. The disadvantages of a bigger putter grip can often fall into the below categories, but ultimately are down to personal preference. Some bigger putter grips are often heavier than standard size putter grips. The heavier weight of a putter grip can sometimes make the head of the putter feel lighter. This might make your putter feel different and take a little time to get used to putting with it again. Sometimes bigger putter grips can feel different in your hands due to the fact that they are larger in size. But the feel of a putter grip will be different with any putter grip you chose to try. As larger putter grips effectively limit the movement of the small muscles in your hands and wrists during putting this can often benefit higher handicap golfers. But some golfers prefer feeling the small muscles and place greater importance on being able to activate these when putting. Just like choosing a putter grip and putter, the best way to grip a putter is the way that feels most comfortable and in control, for you, when you practice and play. 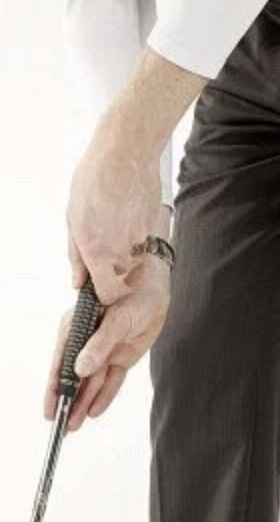 This is similar to the traditional overlapping putter grip, except the hands are switched so that the left hand is now the lowest on the grip. 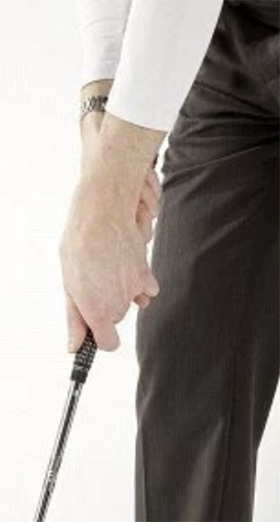 The right hand holds the putter in the same way it would hold a pen or pencil. The key to good putting is keeping your wrists steady, that’s why we invented our grips so we could help you do just that. Below are our best bigger putter grips to help you putt better and an outline of why they could be right for you. The Reflex tour is an oversized grip. The sides of the grip are more rounded in profile, and features a minimal taper from top to bottom to reduce tension throughout the hands and arms. The shaft features a patented off-centre shaft technology providing you with unrivalled ability to keep you writs locked. The face of the grip provides a wide flat section for both thumbs to sit comfortably. The React Tour is an oversized grip. The sides of the grip are rounded and are smaller than the P2 Reflex. It features a minimal taper from top to bottom to reduce tension throughout the hands and arms. The shaft features a patented off-centre shaft technology providing you with unrivaled ability to keep you writs locked. So if you are starting to think your putter just isn’t working for you anymore and it might be time to replace it with a newer model, there is a more cost-effective option. It might be time to replace your standard size or midsize grip with a bigger putting grip or try a bigger putter grip that focuses on enhancing your putting performance. This is a more cost-effective option. Don’t hesitate to reach out to us if you need any more advice on what putter grip might be best for you.